Wicked Weeds, A Zombie Novel combines Cabiya's expertise in fiction, graphic novels and film to create a memorable literary zombie novel of a dead man's search for his lost humanity that can now take its place alongside other leading similar novels like Jonathan Mayberry's Patient Zero, S.G. Browne's Breathers: A Zombie's Lament, Daryl Gregory's Raising Sony Mayhall, World War Z by Max Brooks, and The Reapers Are The Angels by Alden Bell. As for the novel's immersion in orality and Caribbean folk traditions and noir it can very well align with Wade Davis' The Serpent and the Rainbow and Karen Russell's St. Lucy's Home for Girls Raised by Wolves. Set at the contact zones between Haiti and the Dominican Republic, this is a polyphonic novel, an intense and sometimes funny pharmacopeia of love lost and humanity regained; a most original combination of Caribbean noir and science-fiction addressing issues of global relevance including novel takes on ecological/apocalyptical imbalance bound to make an impact. A Caribbean zombie—smart, gentlemanly, financially independent, and a top executive at an important pharmaceutical company—becomes obsessed with finding the formula that would reverse his condition and allow him to become “a real person.” In the process, three of his closest collaborators (cerebral and calculating Isadore, wide-eyed and sentimental Mathilde, and rambunctious Patricia), guide the reluctant and baffled scientist through the unpredictable intersections of love, passion, empathy, and humanity. But the playful maze of jealousy and amorous intrigue that a living being would find easy to negotiate represents an insurmountable tangle of dangerous ambiguities for our “undead” protagonist. 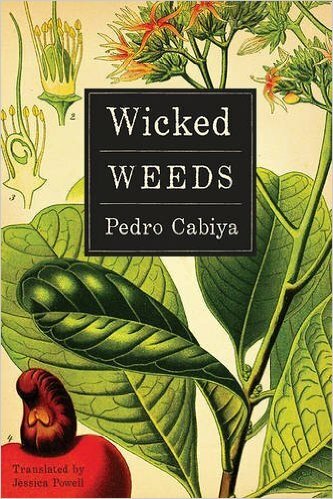 Wicked Weeds is put together from Isadore’s scrapbook, where she has collected her boss’ scientific goals and existential agony, as well as her own reflections about growing up as a Haitian descendant in the Dominican Republic and what it really means to be human. The end result is a precise combination of Caribbean noir and science-fiction, Latin American style. Wicked Weeds, A Zombie Novel combines Cabiya’s expertise in fiction, graphic novels and film to create a memorable literary zombie novel of a dead man’s search for his lost humanity that can now take its place alongside other leading similar novels like Jonathan Mayberry’s Patient Zero, S.G. Browne’s Breathers: A Zombie’s Lament, Daryl Gregory’s Raising Sony Mayhall, World War Z by Max Brooks, and The Reapers Are The Angels by Alden Bell. As for the novel’s immersion in orality and Caribbean folk traditions and noir it can very well align with Wade Davis’ The Serpent and the Rainbow and Karen Russell’s St. Lucy’s Home for Girls Raised by Wolves.